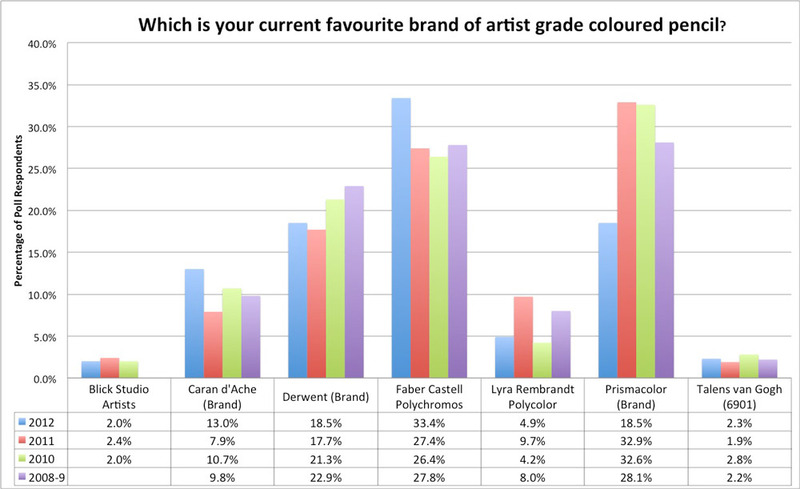 This is my Annual Report on the results of the Annual Poll which asks which is your current favourite brand of artist grade coloured pencil. used by fine artists (whether professional or amateur) - people who would like their artwork to last and/or to sell it. suitable for fine art rather than commercial art where longevity is of no relevance once the artwork has been photographed. Which is the best brand of artist grade coloured pencil? 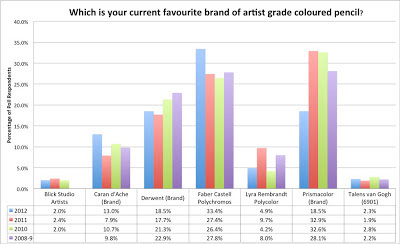 This year 347 people voted during 2011 to determine which is the best brand of artist grade coloured pencil. This is fewere than in previous years but I didn't remind people about the poll at mid-year as I've done in the past. Which means Faber Castell is now the dominant brand and Polychromos is the dominant artist grade coloured pencil within the coloured pencil marketplace for fine artists. For a further explanation of how this comes about see below. It's worth remembering that the performance of different pencils in Opinion Polls is highly dependent on how easy they are to obtain and the patterns of buying behaviour in different countries. What I have found noticeable over time is that as more people buy online they are more likely to try new brands of pencils - and are no longer dependent on the pencil in open stock at their local art store - assuming that this store has survived the recession! The recession has also inevitably had an impact. One might expect the cheaper pencils to be doing better. In fact the reverse seems to be occurring and those with more disposable income seem to be favouring the top quality pencils - even if they are more expensive. I've been running the Poll since 2008 so it's developed a few trends in that time - and we'll look at these below. CLICK THE CHART below to see a MUCH LARGER version of this chart which shows the percentage share each manufacturer earned in the annual polls. The very minor brands have been eliminated from view in the chart for the purposes of this analysis. Two more brands Caran 'Ache and Lyra Rembrandt have been competing for attention - and one - Caran d'Ache - is beginning to have a serious impact in 2012. Faber Castell is now dominant over the combined pencils of all other manufacturers. One pencil - the Polychromos - now has a 1/3 share of the market. It is more than twice as popular as its nearest competitor. The following summary is a product of both the poll, consumer comments available on the Internet (and offline) and recent research. To my mind the current situation can be characterised as follows. Faber Castell has been very focused around the quality of one pencil. It delivers a high quality product of consistent reliability. This has earned the Polychromos many admirers - who in turn recommend the pencil to others! This focus on one pencil gives it a much bigger impact in the marketplace. Sanford has lost its way both in terms of product range, its target market and the quality of the product produced. I have observed lots of changes and no discernible direction in strategic terms plus lots of complaints about matters which the company has failed to address over the years. It no longer feels to me like a manufacturer which is serious about producing quality products for fine artists. Its cheap unreliable pencil appears to be targeted at the younger / student market and children and adults who like colouring pages. Derwent has a huge range of pencils - none of which do particularly well - apart from the Coloursoft. Effort and marketing appears to be spread thin. They could have had the lead in the Lightfast Pencil market - and abandoned it. Issues around lightfastness continue to be relevant to the artist grade range. Caran d'Ache is playing a blinder. It took time to produce a well thought out pencil which has become very popular - the Luminance. Despite its high price, this pencil is attractive, works well and is readily available - it looks likely to continue to be very popular and to grow its market share over time. Not least because it is certified as ASTMS 6901 compliant - and is the only leading artist grade pencil which can claim this. Its growth has also not seriously dented the market for the Pablo Pencil. The company persuade me (and others) that they recognise how long it takes a new product to establish itself in the market and have a focus on continuous improvement. Thus we have my personal 'take' on four manufacturers who all demonstrate a very different approach to how to win share and make money from coloured pencils. While fine artists are only a small part of the coloured pencil market as a whole one is led to wonder why more artist grade pencils don't emulate the success of the Polychromos! I'm going to follow up this Poll Report with in-depth analysis of the main brands. I have eclectic tastes rather than being a dedicated fan of one brand - so this should prove interesting. 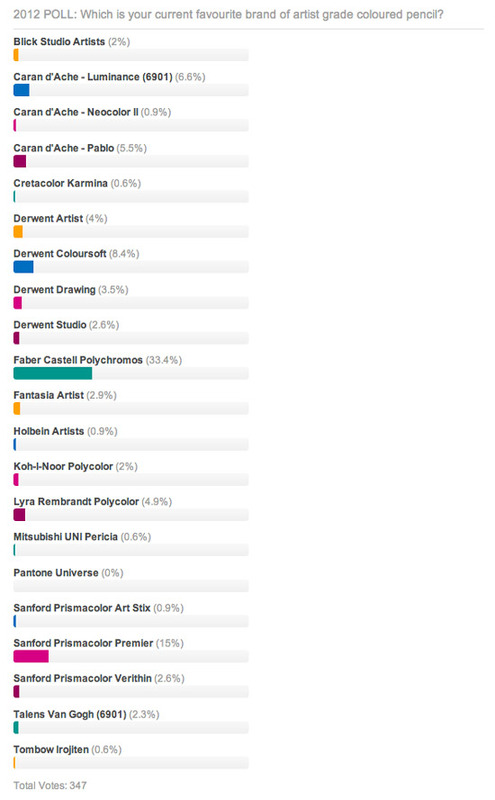 You can now vote on the 2013 POLL: Which is the best brand of artist grade coloured pencil? 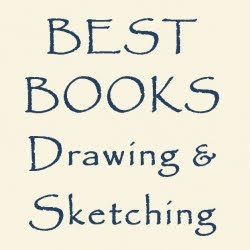 and/or reviews of art products and art books in 2013.